Film footage has been discovered in Norway featuring a group of college students and their recorded interactions with a Troll Hunter. The footage has been painstakingly edited (in chronological order) and authenticated (so that we know it is all real) to enable us to piece together what exactly happened to the students before they disappeared. Because they have not been seen since. Having been little skeptical at the start, I found Troll Hunter to be a surprisingly enjoyable film. You can hardly blame me for being unsure to begin with - this is, after all, a Norwegian mock-documentary about Troll Hunting. Really. However, I have learned from my 500 Days Of Film Challenge that there is much more to film-life than indie rom coms! And this movie is no exception. I had to buy Troll Hunter on DVD as it wasn't available on Amazon Instant Video or Netflix. I then chose to watch it in its original format with subtitles (patting myself on the back in the process for being all grown up as there was an option for English audio!). I think my skepticism was both because of the film’s Troll subject matter (snigger) and also a result of the found footage format. The trouble for me is that, post post post Blair Witch, found footage has been done to death. I was pleased to find that I really enjoyed the mock-documentary format - it didn’t feel forced or annoying. In addition, the Trolls themselves are pretty impressive and the way they are treated by the hunter is really interesting. Of course, the tension is greatest before we see the Trolls. The ground shakes (causing some reviewers to liken the film to Jurassic Park) and the trees sway violently. The Trolls then roar and I moved closer to the edge of my seat. Once you see the Trolls they do lose some of their impact - however, they still remain spectacular in stature - especially when compared to the tiny humans in their path. While I was gripped by the film and enjoying the story, I found that the character I really cared about was Hans, the troll hunter. Otto Jespersen plays his role superbly. He is fed up with his job and views the trolls merely as animals who need to stay within their own territory or risk being hunted down. He rolls his eyes at the naive filmmakers as they mix fairy tale with the grisly task at hand. However, lots of what we and the students know about trolls does seem to be based on fact. For example, they can smell the blood of a christian and they will explode or turn to stone in direct sunlight. 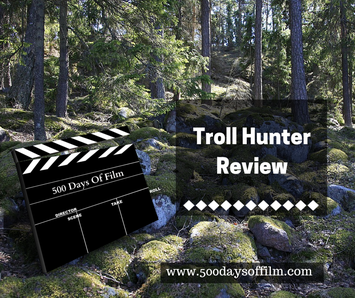 I really appreciated the way Troll Hunter dealt with the extermination of the trolls. It is not viewed as a sport but more an unfortunate, unavoidable, safety precaution. All in all a very enjoyable watch! Click Here And Don't Miss A Review! Having watched Troll Hunter I was interested as to why this film has been rated 15 by the BBFC. It just didn’t seem to warrant the higher rating to me. I duly went to the BBFC website and discovered that the rating was given because the movie features sequences of sustained intense threat. 12A films are allowed to have moderate physical or psychological threat but any disturbing sequences should not be frequent or sustained. It all makes perfect sense now! For more information about BBFC ratings, just click here.